Highland Design Inc. is a complete landscape design and installation company. It is our aim to see a project through from its inception to completion. Tim Paterson is principal and owner of Highland Design, Inc. He started the business in 1995. Prior to this he apprenticed with Dan Kiley in Charlotte, Vermont. While at the Office of Dan Kiley, he worked on major public and private garden projects around the world. 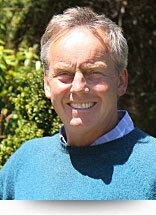 Born and raised in Scotland, he derives much of his inspiration from this background as well as his training at St. Andrews University, Edinburgh University School of Landscape Architecture and the Edinburgh Botanical Gardens. Highland Design has created residential landscapes throughout Fairfield and Westchester Counties. We have also landscaped and consulted on major projects for country clubs and private schools in Connecticut and New York. In addition, we have designed gardens in Nantucket, MA, Long Island, NY, La Jolla, CA, Columbia County, NY, England and Scotland.